The Go Integrator for Mac software is supplied as an Internet download. 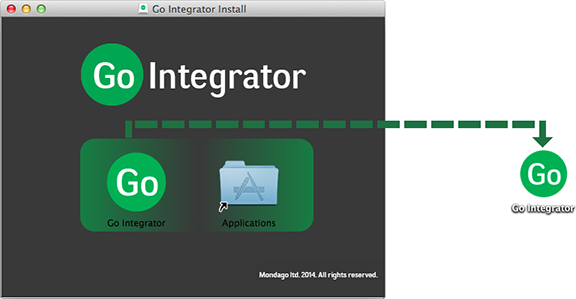 It is a self-contained installer that contains the files needed to install a copy of Go Integrator for Mac. Double-click on the Go Integrator device. Now you've got two options, you can either drag the file across to desktop or just move it to the Applications folder. To do this simply click and hold the Go Integrator icon and drop it on Applications folder or the Desktop. That's it you've just installed the Go Integrator for Mac software on your Mac. To run the application, simply double click on the Go Integrator Application icon from the Applications folder or Desktop.